Increasing longevity is probably the crowning achievement of humankind. But it is fundamentally unjust to continue medical miracles that add years to life without also updating homes for people to live wild, joyful and dignified lives with those added years. As the number of increasingly older Americans grows, over 80% consistently say that they want to remain in their own home . . . but most houses do not support this choice. Updating houses is a first step to creating a supportive environment — a tool for living. Having more people living in community will serve as a catalyst to spur new methods and techniques for delivery of services to the home and a more holistic approach to meeting the needs of this demographic. Nursing homes, retirement communities, and independent living housing all have a role, but additional and more economical options are needed. HomesRenewed embraces the medical and societal advances enjoyed by older Americans by focusing on incentives so that homeowners will update the housing infrastructure to match the needs and desires of residents. This is both a problem and an opportunity. Health occurrences, such as a fall or stroke that render one unable to use their home, come on suddenly. Home updates are not so easily purchased and carried out in a tight time frame. They are best purchased and installed in advance. Incentives should not be limited to older homeowners or those with disabilities. All home improvements which update homes for the modern lifespan should be eligible for incentives. HomesRenewed is focused on positive, exciting and innovative solutions. 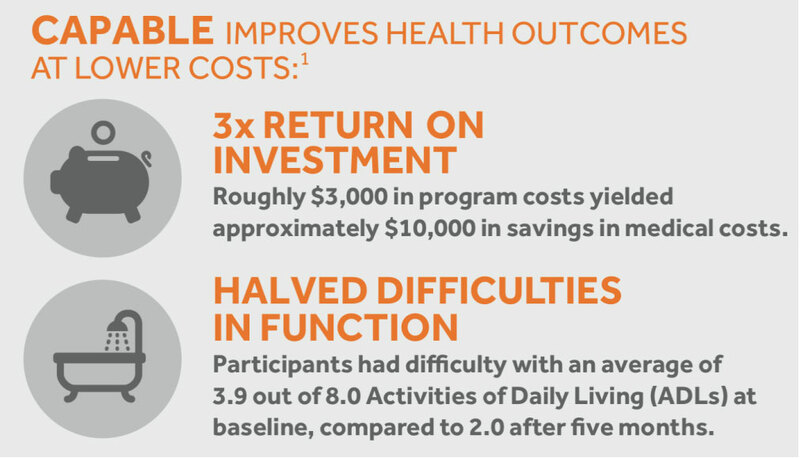 (Community Aging in Place – Advancing Better Living for Elders), a demonstration program conducted by the Johns Hopkins University in Baltimore, funded by NIH and CMS, provides evidence that a small investment in older citizen’s homes returned three times the investment in health care savings. Home upgrades reduce healthcare spending offsetting loss of tax revenues. Too many older Americans have limited choices about where to live. Better, safer and more economical options are needed. HomesRenewed is focused on positive, exciting and innovative solutions to these problems. The central challenge stems from the miracle of increasing longevity. As the number of increasingly older Americans grows, over 80% consistently say they want to remain in their own home… but most houses do not support this choice. This is a problem…and an opportunity. Significantly increased longevity over the past few decades means many institutions are ripe for change. Updating houses is a first and catalytic step to creating a better, more holistic approach. HomesRenewed embraces the medical and societal advances in older Americans by updating our housing infrastructure to match the needs and desires of residents. Health occurrences, such as a fall or stroke that render one unable to use their home, come on suddenly. Home updates are not so easily purchased and carried out in a tight time frame. They are best purchased in advance. All home improvements should update homes. Incentives should not be limited to older homeowners or those with disabilities. We are living much longer than we did even a few decades ago. When this country was founded life expectancy was 32. In 1900 it was 47. When social security was enacted in 1935 life expectancy was only 61. It was a good campaign promise because not many people were going to get paid for very long! By the time Medicare passed in 1965 life expectancy was 71. Now life expectancy is 79, but if you live to 65 you will probably live to 84. Health, the need for medical attention, care and assistance is much greater for those who are 79 to 84+ than for those who are 71. Longevity is a miracle, but also the cause of increasing healthcare costs for older Americans. Almost all aging policy and not for profit programming directed at older Americans is focused on ‘dual eligibles’, those most vulnerable Americans who qualify for both medicare and medicaid. This is critical, important and inviolate. The larger portion of older Americans who have some resources also need the support of policies which promote affordable aging. Incentives that leverage retirement savings into increased real estate value use home updates to transform the homeowner’s house into a tool for successful aging. Not only will this help solve their problems, but it will also stimulate community service solutions and save national Medicare spending. This approach is win-win-win for the HomesRenenwed’s multiple stakeholders. Until recently we heard dire warnings about the the huge numbers of the boomer cohort. Demographers talked about the ‘pig in the python’, envisioning this bulge passing through our institutions. More recently demographers have realized that the millenial generation is as large as the boomers and will probably get even older. The problem is not a bulge — it is the long term future. The solutions we adopt today will be needed for a long time. We have the chance , if we act now, to avoid housing and care crises that will otherwise plague our nation for years to come. Updating Homes yields increased value for homeowners and the nation. The additional value is found in reduced health costs and increasing capability to live and thrive inter-dependently in community, using fewer personal and public resources.